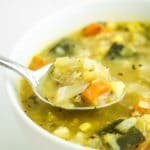 This cabbage soup recipe is made with simple, wholesome ingredients it comes together quickly in the instant pot (or on the stovetop!) It’s freezer friendly, too! Add oil to the instant pot and turn it on the sauté function. Add carrots, celery, and onion and sauté 5 minutes until softened. Add garlic and sauté 3 more minutes. Add cabbage, corn, zucchini, and broth, then stir to combine. Set the instant pot to soup function for 20 minutes. After 20 minutes, turn the valve to instant release. After pressure has released, open and stir. Serve and enjoy! Add oil to a large pot and heat to medium low. Sauté carrots, celery, and onion 5-8 minutes until softened. Add garlic and sauté 3 more minutes. Add cabbage, corn, zucchini, broth, and seasonings, then stir to combine. Bring to a boil for 5 minutes. Then cover and simmer for 20-30 minutes, stirring occasionally.